Middle Creek Wildlife Management Area is one of the premier birding spots in eastern Pennsylvania. Join us for this birding tour of Middle Creek as we enjoy the sights and sounds of Snow Geese, Tundra Swans, and other waterfowl. 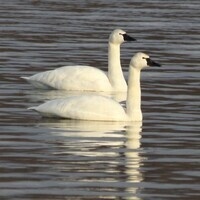 Cackling Geese and the rare Ross’s Goose have been located among the Snow Goose flocks during previous trips. Bald Eagles and sometimes Golden Eagles have been seen. Please dress for the weather and bring a lunch and binoculars. This is a great opportunity for photographers. Participants should meet at the Middle Creek Visitor Center at 10:00 AM. For those interested, leaders will stay until dusk to look for Short-eared Owls and listen for American Woodcocks. Registration is required.